Welcome to our second edition of PuzzleNation App Reviews! Today we continue our quest to delve into the world of puzzly games and apps for your tablet or smartphone! Our resident App player and puzzle fiend Sherri has another intriguing game for us today, so without further ado, let’s explore her review of Pirate Ring! Who doesn’t want to be pirate? Sailing the seas; hunting for treasure. Well, Pirate Ring is an iOS game that will allow you to test your strategic mettle against AI pirates. I played the one-player mode, and the AI opponent was a beast! In one-player mode, you play as gold versus silver. Your goal is to recruit more ships than your opponent does. There are three levels of gameplay: Beginner, Journeyman, and Captain. Beginner is practice mode, and you earn rewards in Journeyman and Captain modes. 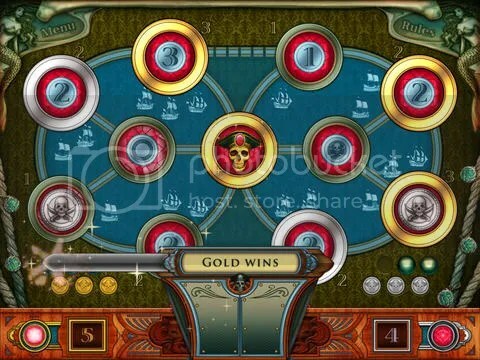 Once you have enough ships for the win, move one of your pieces, a ring or coin, to the pirate in the center. Then, the battle commences! I am not a huge fan of strategy games, but I found myself playing this game over and over and over because I just wanted to win. The graphics, while simple, are intricately detailed. You feel like you are strategizing over a table. If you want a game that really taxes your brain, this is a good one to play. Enjoyability: 2/5 – I found the game to be frustratingly difficult. Apparently, I’m not much of a strategist. Those who enjoy strategy games would want to check out this game. How well puzzles are incorporated: 3/5 – This is a very strategic game. You always need to think several steps ahead in order to beat your opponent. Good luck! Graphics: 3/5 – You play on a static map. I, personally, loved the game board. For a brief time, it made me feel like a good pirate. Gameplay: 2/5 – There isn’t much that changes, so it’s pretty monotonous, though I wanted to keep playing to win! 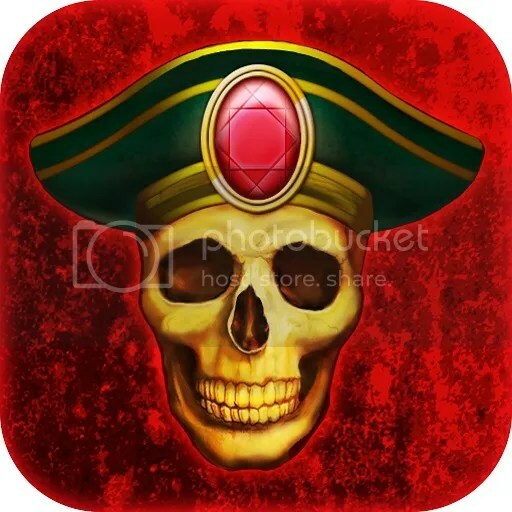 This entry was posted in Games, PuzzleNation, Puzzles and tagged app review, games, Geeking Out, iPad, pirate, Pirate Ring, Pop culture, PuzzleNation, Puzzlin' fool, Sherri, strategy, strategy game by gmdirect. Bookmark the permalink.